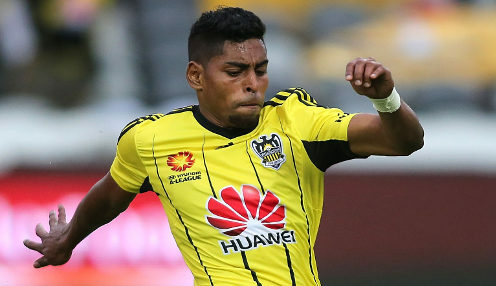 Wellington Phoenix grabbed their biggest A-League win as they hammered bottom side Central Coast Mariners 8-2 in Gosford. The New Zealanders eased their fears of missing out on the Finals Series as they moved five points clear of seventh-placed Newcastle. Roy Krishna and Sarpreet Singh each scored twice at Central Coast Stadium, with Mark Rudan's side netting four times in each half. It was a result that cost Mariners coach Mike Mulvey his job, as the club announced within hours that he had been sacked after a return of just seven points from 21 games. Krishna's brace took his season's tally to 14, level at the top of the Golden Boot race with Sydney FC's Adam le Fondre. The goal glut started in the eighth minute when Krishna's cross was directed into the goal by Mariners defender Sam Graham at the near post. Fijian striker Krishna then doubled the lead when he lobbed over the head of keeper Ben Kennedy after collecting a long ball from Antony Golec. David Williams was next on the scoresheet, firing home from a three-on-one situation that began when Krishna won the ball off Graham. Krishna latched onto a defence-splitting pass from Max Burgess just before the break to blast his shot past Kennedy to make it 4-0. Teenage defender Liberato Cacace grabbed his first A-League goal soon after half-time, sparking a three-goal burst in the space of nine minutes. Singh made it 6-0 and Louis Fenton netted two minutes later, before the Mariners finally gave their fans some respite. Jack Clisby and Stephen Mallon pegged back two goals, scoring seven minutes apart midway through the half. But Wellington weren't done, and Singh scored their record-breaking eighth goal when replacement Cillian Sheridan drew Kennedy and passed to his unmarked team-mate who cooly slotted home from close-range. Wellington Phoenix are 16/1 to win the Grand Final. The Phoenix are 6/5 to win their next game against Western Sydney, who are 2/1 with the draw 11/4.